Harith Augustus, 37, a barber in Chicago's South Shore neighborhood, was shot to death on July 14. His death sparked protests in the city that resulted in clashes between the police and residents. The officer who shot Augustus was placed on desk duty. In one of the 18 new videos released by the Civilian Office of Police Accountability Thursday, the officer's body camera captured the aftermath of the shooting. In the video, as the sound kicks in just as Augustus falls to the ground, screams can be heard and the officer says in a shaken voice, "Police shot. Shots fired to police... or police officer.."
(Chicago Police Department/Handout via Reuters) Harith Augustus, 37, fatally shot by police, is seen fleeing from Chicago Police in this still image from police body camera video footage taken in Chicago, July 14, 2018. He then whispers to himself, "F--k."
When another officer, a woman, moves towards him and asks him, "You OK? You all right?" he says to her, "Why did he have to pull a gun on us?" The officer can be heard later in the video saying "I had to." The officer is later heard saying, "He was going to shoot us." and at another point saying, "He pulled a gun on us." "I know he did, I know he did. Look at me, you're OK," she responds and he starts to pace, then heads towards the body. After the shooting, police had said that officers approached Augustus after they noticed a bulge in his waistband that they believed was a weapon. (Chicago Police Department/Handout via Shutterstock) Frame grab from a handout body camera video released July 15, 2018, by the Chicago Police Department shows Harith Augustus with what appears to be a handgun in a holster on his right as he is confronted by Chicago Police officers shortly before they fatally shot him in the South Shore neighborhood of Chicago, July 14, 2018. 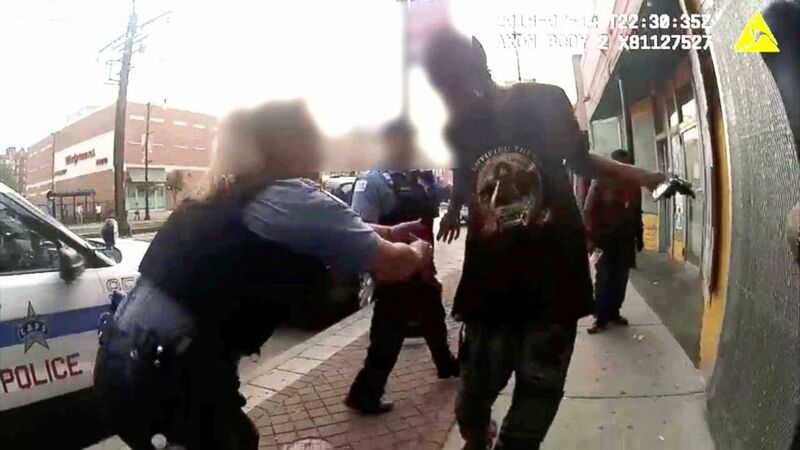 "As he became combative, flailing away, he broke free from the officers and they thought he appeared to be reaching for a weapon -- which he did have a weapon on him -- and officers tragically shot this man," Chicago Police Chief Fred Waller said. Police said they recovered a semiautomatic-type weapon and magazines from Augustus after the shooting. A smaller portion of the officer's body camera footage which had no sound, had been released immediately after the shooting. In that, several officers watch Harith Augustus walk by, then begin to follow him. They then surround him and speak to him and two of them grab him. Augustus tries to get away, and as he backs towards the road and runs, he may appear to reach towards his waistband, then is shot. The 18 new videos released by the Civilian Office of Police Accountability are a combination of footage from different body cameras, a police observation device mounted at a distance, and videos recorded by "third parties" -- including surveillance cameras on nearby stores. 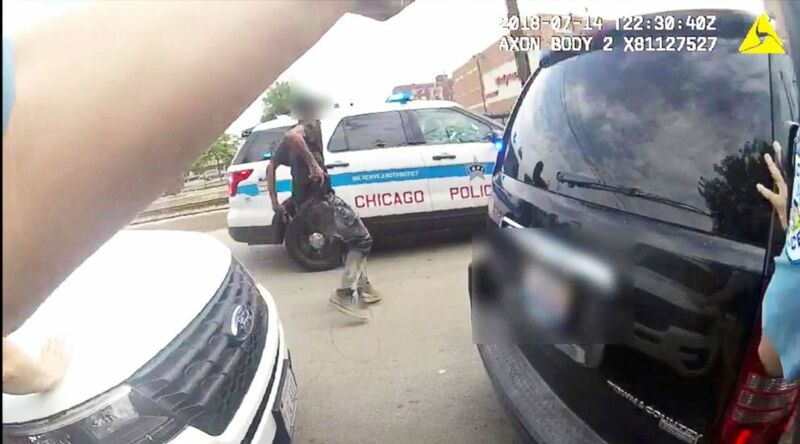 Critics said the release of different and incomplete portions of the video with a gap of several weeks cast doubt on the police's commitment to transparency, Chicago ABC station WLS reported. Standish Willis, the attorney for Augustus' family, spoke on camera and pointed out that little is known of what prompted the struggle and what police said to Augustus just before the shooting. "It's hard to determine why they would pick this young man and decide to go after him," he said. "They say... that they thought he had a gun. Well, I don't know if that's enough nowadays to start going after somebody and end up shooting them in the back several times." Augustus suffered wounds to the "back of his head, left shoulder, chest and buttocks," the Chicago Tribune reported, citing the Cook County medical examiner's office. (Chicago Police Department/Handout via Reuters) Chicago Police attemps to grab Harith Augustus, 37, who was fatally shot by police moments later, in this still image from police body camera video footage taken in Chicago on July 14, 2018 and released on July 15, 2018. Augustus was a well-known figure in the neighborhood, working as a barber at a shop just a few blocks from the shooting, according to WLS. In the immediate aftermath of the fatal shooting, protests began in the area. WLS captured video of protesters pushing and shoving back and forth with police officers. Police said three or four officers suffered minor injuries in the protests when demonstrators threw rocks and glass bottles at them and four protesters were arrested. Just hours after the shooting, the Chicago Police Department released a preliminary statement about the shooting saying the officer who fired the shots would be "placed on routine administrative duties for a period of 30 days." The shooting is under investigation by the Civilian Office of Police Accountability. ABC News' Mark Osborne and Rex Sakamoto contributed to this report.